Forefather is one of those dedicated bands that not many people know about (at least I haven’t had a clue), which stick to their guns and issue an album every 2 years or so. Brothers Wulfstan and Athelstan (very Anglo-Saxon choice of artistic names to be creating under) have been toiling in relative obscurity for about a decade now, and had it not been for Metalhit.com licensing their latest Last of the Line album from their own Seven Kingdoms label, the under-the-radar quality of Forefather would have continued for this metal fan. Hopefully, the band has a more knowledgeable dedicated following, as the style of music Forefather plays calls for one. Not wanting to be lumped into the black-oriented pagan metal scene, Forefather almost pointedly eschews any blackened gimmicks that could have it placed alongside Finntroll, Ensiferum or Turisas. 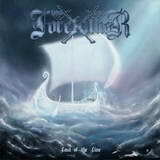 Forefather is bent over backwards trying to create a powerful, prideful, battle-ready, epic atmosphere, by employing catchy galloping riffs, straightforward rhythm patterns, characteristic melodies, soaring solos and dual vocal patterns. If one were to trust Forefather with their take on pagan metal, the conclusion definitely must be that Anglo-Saxon version of the genre is very economical, and sometimes downright austere. Forefather is the last thing from adventurous in the songwriting department. They use clearly defined parts and repeat them often. Once they lock into a rhythmic pattern, they rarely deviate either. Most of the songs hurtle along at the hurried pace, propelled by steady double bass (title track) and deliberate blast (Shadows of the Dead). But if Forefather step away from their gallops, Up High takes on the mid-tempo pace and never changes its cadence. In that aspect, Doomsday Dawns is the most epic and the most varied song on the album, where the band’s entire arsenal is brought to bear. There is a piano/harp intro, tremoloed verse riffs and towering chorus. Where the band does not lack is in the catchiness department. Their melodic progressions are somewhat Amon Amarth-like and simply wash you along with them (Shadows of the Dead, Chorus of Steel). When their riffs work, like in Chorus of Steel, these songs become anthemic and you would want to spin them again while fist punching the air, but sometimes (Wyrda Gesceaft) the band simply scrapes by. If one wants to feel the seagulls in the air, salty mist of some northern sea, the long ships plowed into battle, grim warriors piling into shield-wall, Forefather is clearly the band providing the soundtrack. If I met any of the songs from Last of the Line on some pagan metal compilation I would definitely want to hear more. As a full dozen, at times I was wondering if there is enough variety for a whole album, and every time I did so the band won me over with a clever harsh-clean vocal combo (By Thy Deeds, Wolves of Prayer) or with a cutting melody which sunk as deep as a splinter (Chorus of Steel, The Downfallen). If not spectacular, then at least very solidly made, Last of the Line is the album to enjoy even if more blackened, and less power metal, pagan attitude is your calling.